A good ergonomics kitchen design must put physical, cognitive and organizational ergonomics into consideration. It is defined by the 'kitchen work triangle' and must also remember the ergonomics of good lighting. 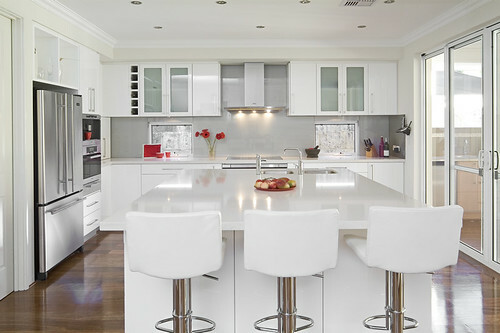 Whether you are designing a new kitchen or thinking of where to put your new refrigerator, here are some kitchen ergonomics principles to help you decide the best layout. These principles do not vary much according to the size of your kitchen. In Ergonomics Kitchen design, the interior designer must have a solid knowledge of ergonomics. Most people think that ergonomics just refer to office ergonomics, but there are different types of ergonomics which can be applied to the home and in this case, the kitchen. Cognitive Ergonomics applied to kitchen design because it studies how the mind thinks and organizes workflows when using the kitchen. This way we cook and prepare food (and wash up later) is affected by the layout of the kitchen design. Organizational Ergonomics is applied here where it is concerned with optimizing the workplace of the kitchen. Do you sometimes feel frustrated while cooking in your kitchen? Do you have an area in the kitchen where you spill things more often than you should, or find yourself knocking or bumping into things? Do you wish the sink was closer or that you did not have to walk around to the other side to get to the fridge? Then, you know what I'm talking about. These things that you need can be solved by applying ergonomic principles to make us all more productive and efficient despite the kitchen size (too big or too small). An efficient kitchen is said to have a good work triangle. The goals of a good work triangle is to set up the kitchen in such a way that the three most common 'working areas' - the refrigerator, sink and stove - at the most efficient distance apart. Travelling distance between this areas are also minimized as much as possible. These represent the three points of the kitchen work triangle. If you place these too far away from each other you waste a lot of steps while preparing a meal. If they are too close to each other you have a cramped kitchen with out any place to work. See more ergonomic kitchen design layouts. The most important lighting is ones under the kitchen cabinets where you prepare your food and when you are cooking. When you are using a knife and chopping food, you'll need sufficient light all around, because you are in a potentially hazardous situation. A spotlight, a lamp is not enough. Useful articles for ergonomics kitchen design. Thank you for reading 'Ergonomics Kitchen'!